'Oumuamua, the first known visitor from beyond our solar system, is long gone, but it's still leaving scientists guessing. A new explanation proposes that the strange object was a "monstrous fluffy dust aggregate" — that's a technical term, apparently — produced by a busted-up comet. That's the explanation laid out by Zdenek Sekanina, an astronomer at NASA's Jet Propulsion Laboratory, in a new, unpublished paper. The explanation draws on observations of comets breaking apart as they get closer to the sun. 'Oumuamua is the interstellar object that astronomers detected whizzing through our solar system in October 2017. It was the first interstellar object scientists ever spotted, although they expect thousands more have gone unnoticed. 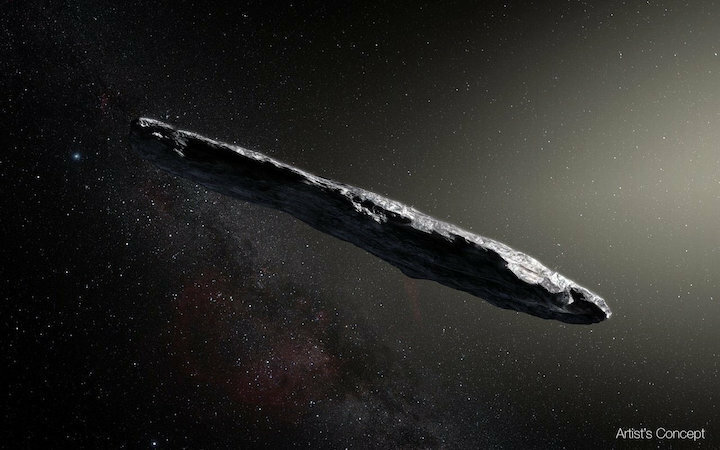 Ever since 'Oumuamua's appearance, scientists have debated what the object is: asteroid or comet, ripped-up planetesimal, or of course, the least likely explanation, an alien probe. The new paper adds another loop to the already-knotty issue by suggesting that the object changed during its brief time in our solar system. Scientists caught sight of 'Oumuamua only when it was already on its way out of the neighborhood, after all. So, while the object appeared reddish, long and thin during its exit, it may have started out with different properties. Starting with that idea, the new paper compared 'Oumuamua to other faint but more mundane comets that astronomers have observed. Typically, when these faint comets come within a quarter of Earth's distance from the sun, they don't survive the visit. And a comet's death is not a quiet process; instead, these comets experience a so-called outburst that triggers their disintegration. Specifically, the paper considers a comet called C/2017 S3 (Pan-STARRS), which crept in from the Oort Cloud, which surrounds our solar system. This comet experienced two of these violent outbursts before finally falling to pieces. Observers gathered some strange data that suggested C/2017 S3's remains had become "a monstrous, extremely fluffy aggregate of loosely bound dust grains" before it even reached its closest approach to the sun. While 'Oumuamua's precise origins and structure have confused scientists, this explanation offers a new complication: that the object wasn't actually a solid body when scientists first spotted it but was instead a clump of remnants. The new paper proposes that a similar fate to C/2017's befell 'Oumuamua, with its outburst coming before any scientific observations occurred, thus disguising the object's original structure. The paper was posted to the pre-print server arXiv.org on Jan. 30.